Salem is a mid-sized city about 20 miles north of Boston. With a world-class museum, a well-preserved historic quarter, and a thriving bar, restaurant, and arts scene, it is one of the cultural capitals of the Boston region. However, it is best known worldwide as the site of the infamous Salem Witch Trials. In 1692, several young girls in the Puritan town began experiencing fits of hysteria. The deeply religious Puritans suspected that the girls had been possessed by witches in their midst, and sought to rid Salem Village of all of the supposed witches. Neighbor soon turned against neighbor as many women throughout the town were accused and tried for witchcraft, and then burnt at the stake. Three centuries ago, the Salem Witch Trials were a devastating example of the evil that can happen when superstition, ignorance, and paranoia collide. Today, it’s big business for Salem. Because the Witch Trials came to be known worldwide as the last gasp of medieval chicanery in a modernizing world, Salem has effectively capitalized on its image as the Witch Capital of the World. There are witches everywhere, from the police cars, to the occult stores, right to the center of town. A couple of years ago, Salem put a statue of Samantha, the witch star of the beloved sitcom “Bewitched” right in the center of town. 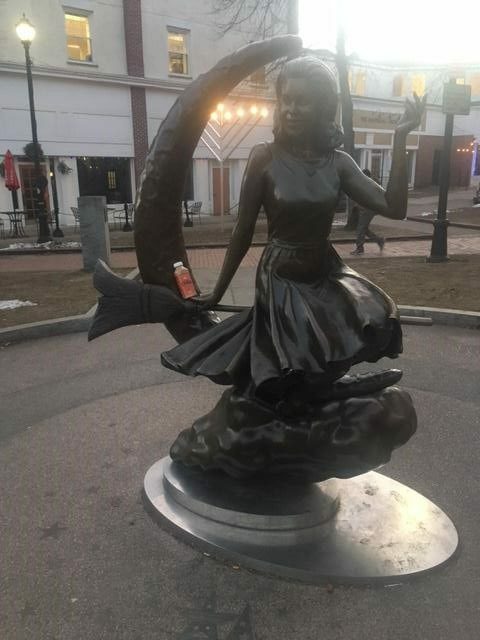 Though some thought this was in poor taste, the Samantha statue has quickly turned into one of the many icons of modern Salem. 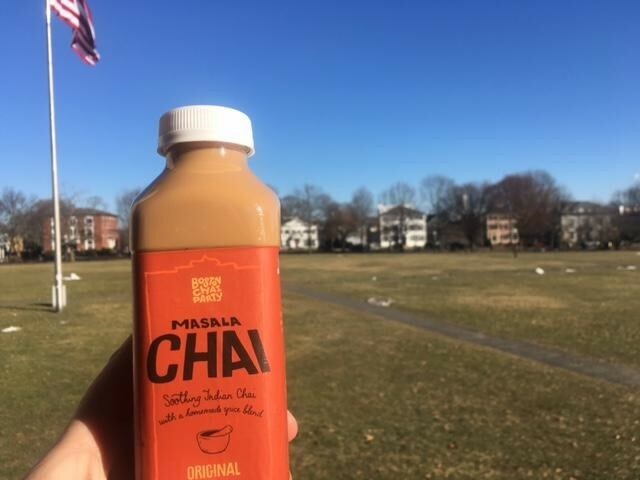 Witches crave fresh-brewed authentic chai tea that’s easily drinkable while they’re flying through the night skies on their broomsticks, so Samantha likes to keep some Boston Chai Party tea right easily accessible to her at all times. Another major attraction in Salem is, of course, the Witch Museum. There are a few different museums in Salem devoted to the witch trials, like the Witch History Museum and the Witch Dungeon Museum, but there’s only one official Witch Museum. 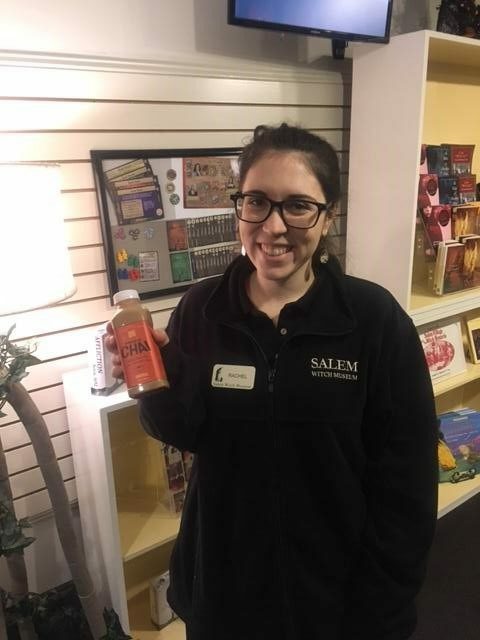 Not only does the Witch Museum provide an effective (and seriously creepy) account of the trials and thought-provoking parallels to today’s world, its looming, haunting Gothic architecture resembling a medieval prison is a well-known landmark of Salem. 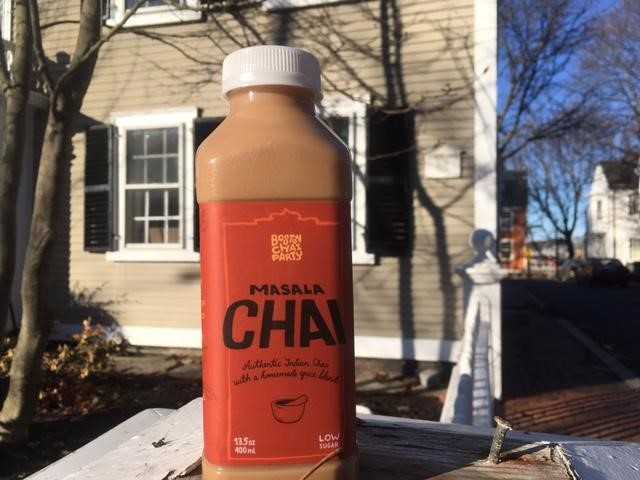 We took our chai to meet Rachel, the Educational Coordinator at the Museum. To the gazebo overlooking the spacious and gracious Salem Commons…. 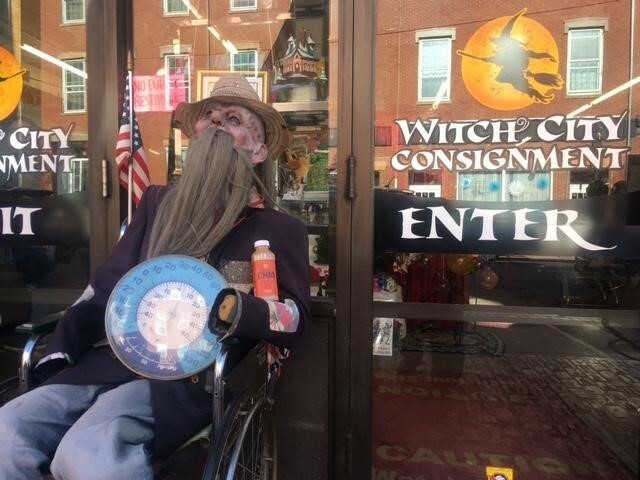 ….Past a ghoul guarding the treasures of Witch City Consignment – (no one, not even our chai, got past him)…. And finally ended up on the Essex Street Promenade, a veritable Knocturn Alley of New Age and occult shops. I’d venture to say there are more psychics per square inch here than in the rest of Massachusetts combined. 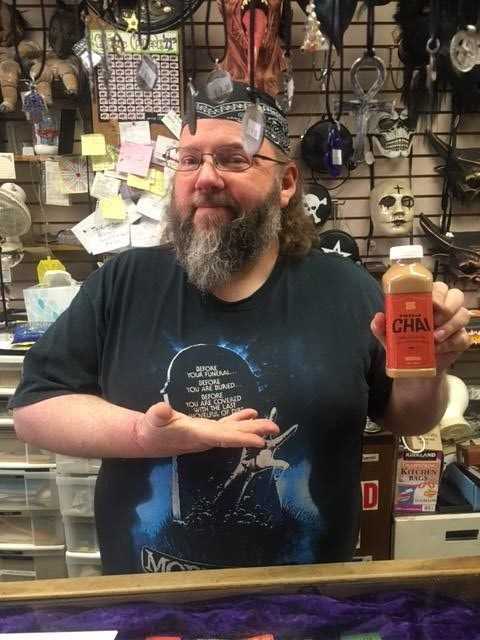 Our chai wanted to know its future, so it went to talk to Dave at the Magic Parlor. The Magic Parlor is a full-service magic shop, selling everything from masks, crystals, tarot cards, makeup, and straight-up wacky, far-out things you couldn’t find anywhere besides Salem, like a tarantula globe or a straight-up magic wand. (In fact, Salem has an actual wand shop called Wynott’s Wands!) 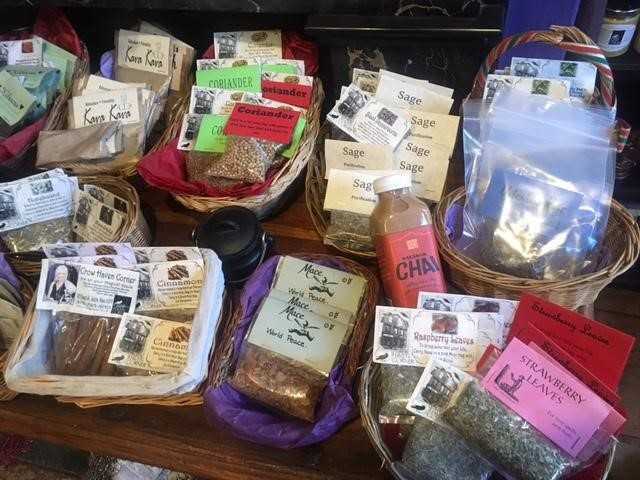 They also have some herbs and spices that our chai was very interested in. Let’s hear Dave tell us a little bit more and then try the tea himself. Salem might be best known for its witches, but people forget that like so much of our great state, it has a beautiful coastline. For much of the 18th and 19th centuries it was a formidable maritime power. Ships docked in Salem sailed across the world, bringing back valuable treasures. 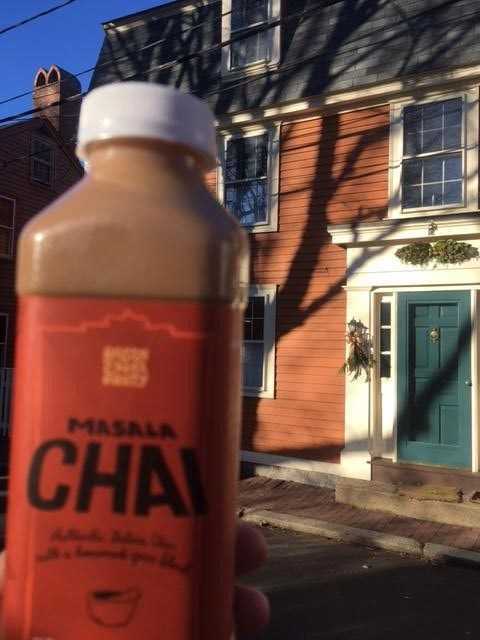 The grand historic homes once belonged to merchants who grew rich from trade. 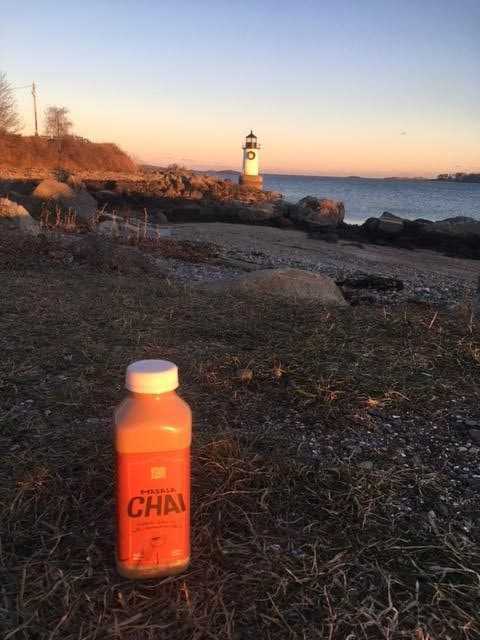 At the end of a long day, the chai wanted a moment to itself, so it went to Winter Island, a picture-perfect peninsula overlooking Salem Sound. 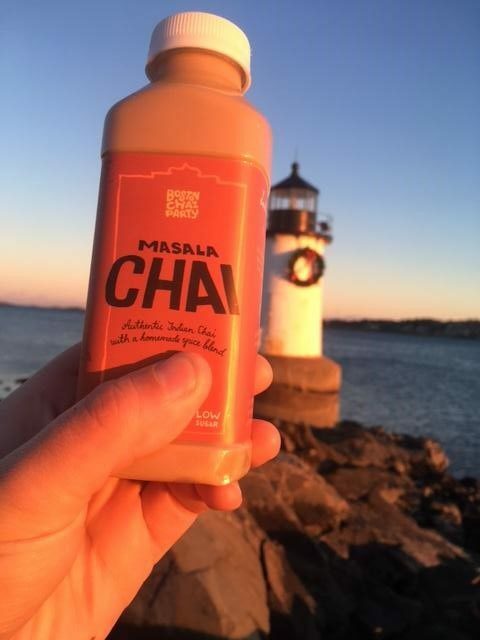 Merry Chai-mas! !